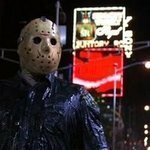 What If Jason Decided To Use Ted's Mask Near The End Of Part 2? Where Would You Rank Harry Manfredini's Score From The Game In The Series? Could An Argument Be Made That Steve Cristy Is Just As (If Not More) Responsible For The Crystal Lake Murders? Some interesting news for serious collectors. Favorite Songs from a Slasher Movie? Friday the13th marathon on now!